Above are some basic signs that can be used to help communicate with your child. submitted by Michele Ricamato, M.A. CCC-Speech and Language Pathologist from West Chicago, Illinois. As a practicing speech and language pathologist working primarily with children diagnosed with autistic spectrum disorders, I have witnessed firsthand the benefits of sign language as a means for augmenting communication. My therapeutic work with children who have disorders relating and communicating, has been influenced heavily by Drâ€™s. Stanley Greenspan and Serena Wiederâ€™s Developmental Individual/Difference Relationship Based Therapy (DIR Â®) and by developmental language acquisition models (Bloom and Lahey, Bloom and Tinker). As a result of these influences, my understanding of how a linguistic system develops has taken on a much broader and holistic conceptualization. In order to fully appreciate the benefits of sign language for children with limited ability to express themselves, it is important to understand language in a more comprehensive way. In my research, I found that language is far more than the sounds or sentence structure that make up what we speak. In fact, sounds and words without meaning are devoid of substance. It is the arbitrary meaning that each culture assigns words and word combinations that supports true communication. Research proves that language has its critical beginnings within the first three months of life. Early precursors include the ability to reference another (using eye gaze for communicative purposes), sharing attention with a caregiver, and later, using gestures and facial expressions during communicative exchanges. These non-verbal capacities build solid and critical foundations that support later language levels. Typically developing children develop and expand their language by experiencing their world and environment in multi-sensory contexts. Their meanings of concepts and events, and the relations between people, actions and objects become gradually expanded as they encounter the world through relationships with their primary caregivers. Language gives children the ability to express ideas, communicate novel thoughts, and represent themselves to others. As a result, relationships flourish through a mutually agreed upon way of communication. Children diagnosed with Autistic Spectrum Disorder often have challenges developing robust gestural and non-verbal communication. Due to very complex challenges in visual, auditory, spatial, and tactile sensory systems, children with relating and communicative disorders often experience difficulties in comprehending a broad range of meanings for the concepts and relations expressed through words. Their ability to become intentional communicators can be limited by the above deficits. I find that sign language often provides a bridge to support a childâ€™s ability to gesture more frequently and with greater complexity, and provides more information about the meanings of words, events, concepts and relations. Children who have motor deficits may find it challenging to use sign language accurately but because of their exposure to sign language, they have the ability to express novel ideas through gestures that can be interpreted by primary communicative partners, which supports a childâ€™s intentionality. The child is able to see that they are in fact, a communicator and that their message is received and acted upon within their environment. They are also able to share experiences, which leads to a more powerful desire to communicate further. The power to be understood and to send messages that are received readily fosters more intentionality and the desire to make more â€œmeaningâ€ within oneâ€™s world; they become more empowered the more they feel understood by others. Using sign language specifically as an alternative communication form has often raised fears for families that if this method is employed for children not yet developing verbal expression, verbal expressive language may never develop. Research within the field of speech and language pathology, as well as alternative and augmentative communication, has conclusively proven otherwise. I have found that language and communication is less about the production of sounds and words and more about the expression of shared meanings within primary relationships. It stands to reason that the creative process is critical to language development and is more acutely demonstrated in the sharing of experience and ideas than of the actual verbal production of words. Again, words without meaning lack the hallmarks of communication. Therefore, children who use sign language as a means to communicate have the ability to express their inner ideas and other cognitive processes with another. Within my own clinical work, I have witnessed the power of sign language. Families have often come with stories of meeting with professionals who have indicated that the severity of the motor deficits impacting speech production for their child indicates that they will never verbally produce words. Explaining the process of typical language acquisition and the importance of laying foundations rooted in later language development is often comforting as we begin our work together. Our focus begins with building meaning and comprehension for the child while using a wide range of non-verbal modalities and a variety of means of expression. It is always miraculous to see a child share experience and meaning with their caregiver through signs and more conventional gestures, demonstrating sheer joy at the power of communicating. It is even more miraculous to see many children who, when well supported in this manner, begin to verbally communicate in combination with gestures and signs. Verbal production that is meaningful builds from these very interactions where meaning has already been shared in many other ways, much like the foundations that babies share by pointing and commenting with early gestures before verbally expressing the words that they have already â€œmade meaningâ€ around. The Signing Time video series in particular has had an impact on many of the clients and families that I support. 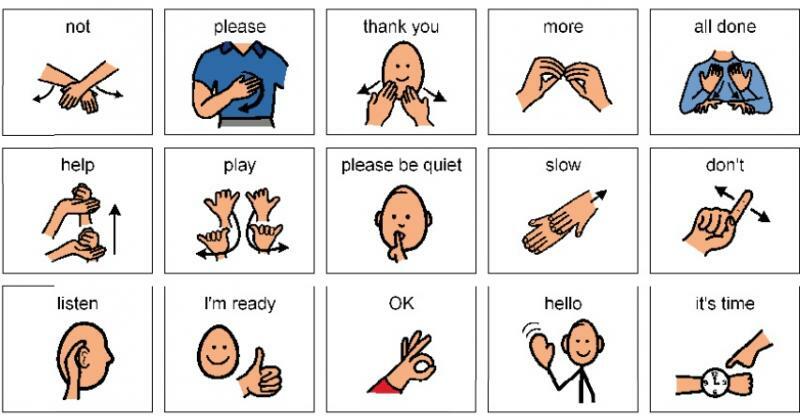 Signing Time offers a unique sign language experience for children. Rachelâ€™s songs are captivating and provide a multi-sensory platform to learning signs that go beyond needs and wants or labels of objects. Children are exposed to a variety of signs in a multitude of contexts, where the relations between the sign, the child and the wordâ€™s meaning are effortlessly combined and reinforced. Repetition of signs demonstrated is offered with many children in many different environments. Songs support interest, attention and engagement so that learning is easily accessible. I recently had a child sign â€œhappyâ€ to me during a fun interaction on the trampoline. I looked inquisitively at his mother who indicated that he had learned that while watching the Signing Time series. It was beautiful to see him so easily and meaningfully use the sign to share his feeling of state within our interaction. What power to be able to communicate such a complex emotional idea when he verbally cannot express this yet. There is the power of sign language â€“ to share meaning with another and build further connections in relationships where a mutual understanding of each other is enhanced by that sharing. For children diagnosed with Autistic Spectrum Disorders, this is a primary goal that we strive for and can certainly achieve when we are open to the many modalities and possibilities of communication. If you have questions or would like to request additional information, please contact Michele at m.ricamato@comcast.net. Bloom, L. & Tinker, E. (2001). The intentionality model and language acquisition: Engagement, effort, and the essential tension. Monographs of the Society for Research in Child Development. 66. Bodine, C. & Beukelman, D. R. (1991). Prediction of future speech performance among potential users of AAC systems: A survey. Augmentative and Alternative Communication, 7, 100-111. Diagnostic Manual for Infancy and Early Childhood ICDL-DMIC (2005), Bethesda, Maryland: Interdisciplinary Council on Developmental and Learning Disorders. 129-165. Greenspan, S. I. (2000). The need for a comprehensive individualized approach, ICDL Clinical Practice Guidlines (pp. 7-11). Bethesda, MD: ICDL Press. Greenspan, S.I. & Wieder, S. (1998). The Child with Special Needs: Encouraging Intellectual and Emotional Growth. DeCapo Press. Greenspan, S. I., & Wieder, S. (2006). Engaging Autism: Using the Floortime Approach to Help Children Relate, Communicate and Think. Cambridge, MA. : DaCapo Press. Lahey, M. (1988). Language Disorders and Language Development. New York, New York: Macmillan Publishing Company. Nelson, K. (2007). Young Minds in Social Worlds: Experience, Meaning and Memory. Cambridge, MA: Harvard University Press. Van Tatenhove, G. M. (1987). Teaching power through augmentative communication: Guidelines for early intervention. Journal of Childhood Communication Disorders, 10, 185-199. We’ve used what used to be called *Total Communication* with The Kiddo from the time he was about 27 months old. It’s speaking and signing at the same time……he has perfect hearing and every once in a while someone will make a snotty comment about that fact. Really, it’s the way he communicates so they can get over it! He has a total of about ten signs he uses and knows about 20 or so more. We actually sign to each other in social situations, especially if The Kiddo is with us and we need to make adjustments. What is called now? It sounds promising.